CERN Engineers have smashed together proton beams in the 27km-long tunnel of the Large Hadron Collider (LHC) for the very first time. While the LHC has been beset with problems over the last year, the first collisions have been described as a major step forward in our understanding of astro-physics and the cosmos. 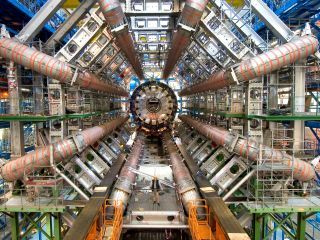 LHC will create similar conditions to those that occurred after the Big Bang, allowing CERN scientists to look for signs of the Higgs boson sub-atomic particle. "It's a great achievement to have come this far in so short a time," said Cern's director-general Rolf Heuer. "But we need to keep a sense of perspective - there's still much to do before we can start the LHC physics programme." The LHC is located in a tunnel 100m beneath the Franco-Swiss border. Fabiola Gianotti, spokesperson for the Atlas scientific team, added: "This is great news, the start of a fantastic era of physics and hopefully discoveries after 20 years' work by the international community."